"The land appertaining to the demesne of Powerscourt has been estimated at 26,000 English acres. De la Poer, a knight in Strongbow's company, was the first English possessor, and by him the castle was built. In the reign of Henry VIII. the castle was taken by the fierce O'Byrnes and O'Tooles of Wicklow; and being retaken by the English, was conferred upon the Talbots. In 1608 the property was given by James I. to Sir R. Wingfield, who was created Viscount Powerscourt in 1618. The enclosed grounds contain about 800 statute acres, of which the greater part is under young plantation. Enough, however, of the old trees remain to carry the imagination back to what the place was some years ago, when venerable oaks were scattered along the sides of the glen. To many, however, a young plantation is more pleasing than an aged forest; to all an extent of wood, covering the sides of a hill, is one of the noblest objects of nature. Large bodies of young trees, as here seen along the sides of the hills, are capable of exciting the most pleasing emotions. The Dargle River here falls over a ledge of rocks 300 feet in height, forming Powerscourt Waterfall, always an object of interest to the visitor. Though often very limited in volume, it is generally not deficient in that grandeur which is invariably produced by the appearance and sound of great natural cascades; the interest of this scene being, of course, heightened in proportion to the quantity of water in the river - and the Dargle, like all mountain streams, is very variable in this respect. 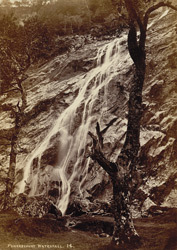 The beauty of outline and surface with which nature has invested all around, as also the height and character of the connecting mountains, must claim for this portion of the demesne of Powerscourt a high place in Wicklow scenery."